I'm happy to have been contacted by House Beautiful to write a post on Grass Cloth a week ago and very honored for the mention and link that will appear in the December/January issue. If you have an iPhone you'll be able to link to Belle Vivir through the HB Connect app. (correction Android phone users can download an free app called Digimarc Discover). It's amazing how dynamic and personal magazines have become. House Beautiful was kind enough to send me the article so I can see it and new watermarked images that will appear in the December/January issue. 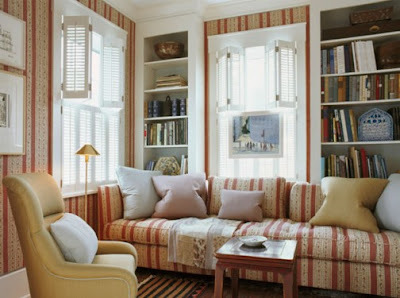 Kevin Isbell knew how to make this1930's center-hall colonial home current by injecting warm and intrinsic details such as geometric trims to floral curtains, gross-grain ribbon tape to a plain white sofa and visually connecting two separate rooms by custom painting grass cloth walls the same color as the ceiling. "Grass cloth has a warmth that paint does not, and darker colors are more cocoon-like" Kevin Isbell. I absolutely adore the contrast between the modern looking cocktail table and the wicker basket in the family room. Notice the detail of the tape on the sofa. It's all in the small details that slowly reveal themselves to you. In this room the grass cloth used is a bit more textured than the one used in the bedroom above. A very applicable difference, I think. You know how I feel about any klismos and klismos influenced chairs, right? It's forever my favorite chair. And the contrast here between the lilac slipcovered chair and the leather brown on the klismos chair is the perfect union of masculine and feminine. I didn't want to spoil the article so I'm only posting the three images above, the two below are from Isbell's website. As they prove, he really knows how to cozy things up. Enjoy! 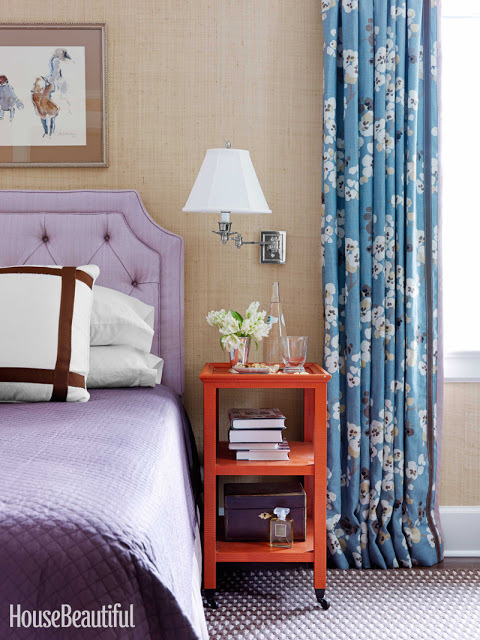 Top three watermarked images exclusive from House Beautiful, last two from Kevin Isbell website. 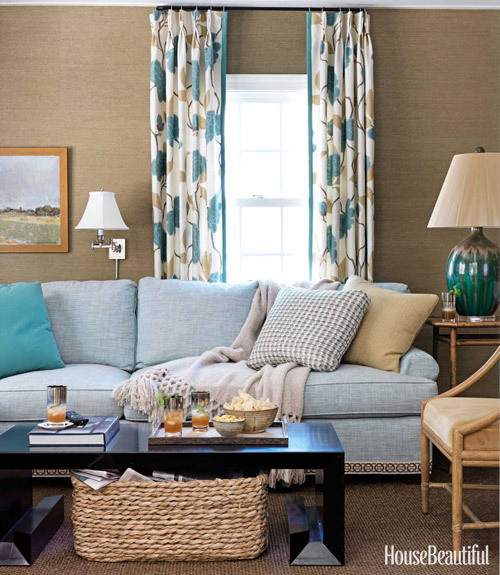 You have read this article cozzy / features / grasscloth/seagrass wallpaper / House Beautiful / Interior Design / Interior Designers / kevin isbell / seagrass wallpaper / warm with the title Thank you House Beautiful! Images yet to be seen. You can bookmark this page URL http://ourpicturewindow.blogspot.com/2012/11/thank-you-house-beautiful-images-yet-to.html. Thanks! No comment for "Thank you House Beautiful! Images yet to be seen"